This article will help you to remove Android Flashlight malware fully. Follow the removal instructions for the malware given at the bottom of the article. 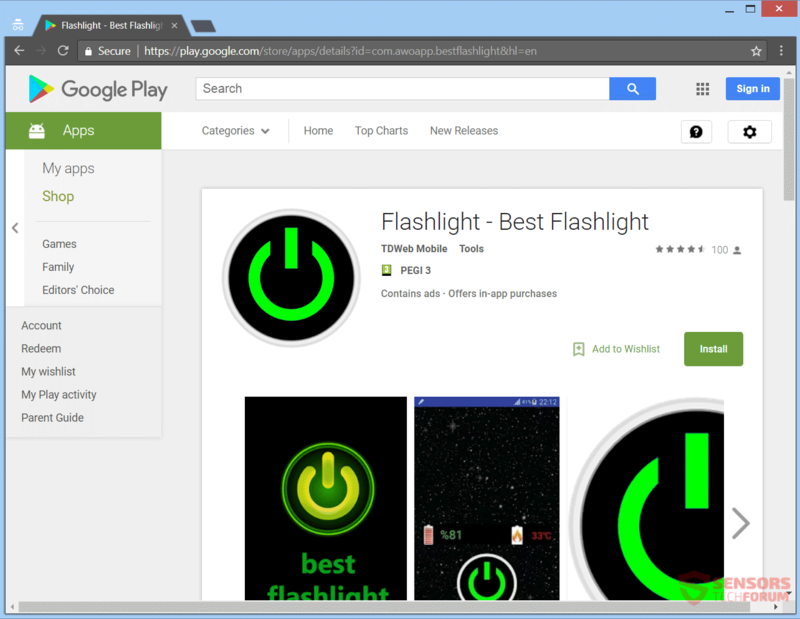 Different Android Flashlight malware applications are scattered across the Internet, including on the Google Play Store. 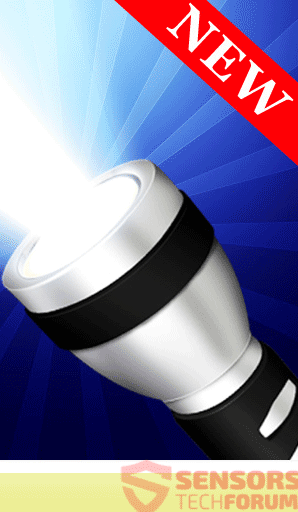 They are promoted as free flashlight applications that focus on turning on your phone camera’s flash into a flashlight. Some of these fake applications don’t even work as a flashlight. You can experience a lot of advertisements and web page redirects when you try to browse the Internet through your phone device if you have a fake flashlight installed such as “Best Flashlight” or even get a banking Trojan on your phone called “Flashlight LED Widget”. Read on to find out some general tips on how to spot a fake Android Flashlight application and try to avoid installing malware on your Android device. Short Description Android Flashlight malware is advertised as a free flashlight application. Instead, the user installs an adware or another sort of malware on the device, making it compromised. The malware might even spread over the network if it’s designed to infect other devices. Symptoms Android Flashlight malware can generate heaps of advertisements, browser redirects or even install an Android Banking Trojan on your phone. In case a hacker gets access to the phone, he could steal information or use your device for DDoS attacks on other devices or for other nefarious reasons. User Experience Join Our Forum to Discuss Android Flashlight malware. Android Flashlight malware can spread using various methods. Third-party installer setups could have put the malware on your computer or mobile device. The threat might only generate advertisements and redirect you or be more serious in nature. These installations typically arrive with freeware or bundled packages. Without your knowledge, additive content could be installed to your device. Avoiding such installations from putting unwanted content is possible if you find Custom or Advanced settings in the install setup. Android Flashlight malware can also spread via numerous redirects and advertisements, that are hosted on various suspicious websites which load scripts. Pop-ups, pop-unders, as well as banners could have links inside of them that can redirect you. When visiting such websites, especially with an unknown origin, they could inject malware inside your device. Regardless of the browser, the app might be installed without your permission. Although in most cases you manually go through the installation process, seeking a good flashlight application. Android Flashlight applications are a great many scattered across the Internet. Unfortunately, there are a lot of them, which are actually malware. The malware ones are promoted as free flashlight applications that focus on turning on your phone camera’s flash into a bright beam of light so you can use it as a flashlight – just like any legitimate flashlight app. Some Android devices do not have an in-built application for that, or the application does not make the flash work with maximum efficiency. 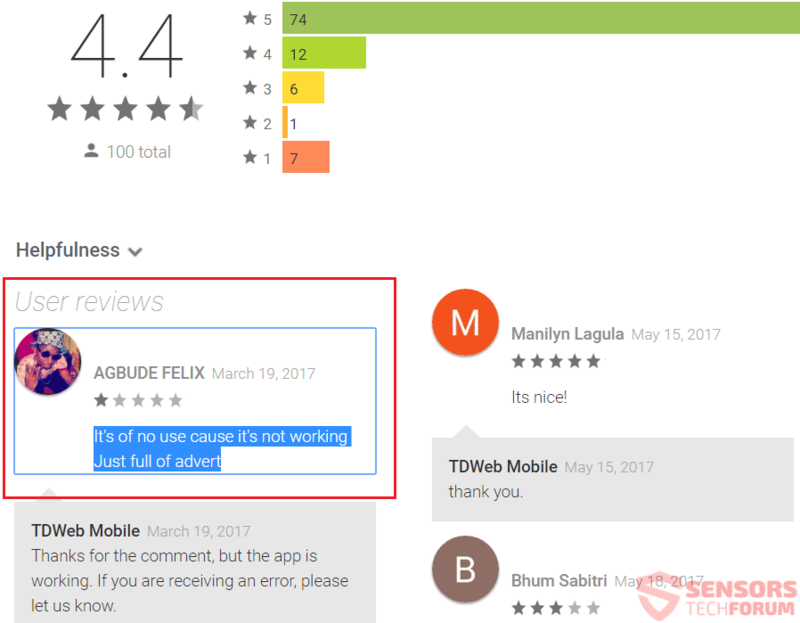 Thus, users search for a better app and fall victim on many fake ones that are either adware or another sort of malware. Some of these fake applications don’t even work as a flashlight. You can keep reading the article below to find out what such a malware can do, an example of such an application and a few tips to follow to hopefully find a legitimate app that really just turns your camera’s flash on and off without doing anything else. Android Flashlight malware is an unwanted software that can vary in type and purpose. Most malware that poses as an Android Flashlight will push advertisements and hinder your browsing via your phone but not stop it completely. Some Android Flashlight malware will spy on you and steal/sell your personal information without you even knowing. Other malware is designed to redirect you to an advert or a page, immediately after you launch your browser, and crash if you try to take the control back over the browsing application. In case the malware is of a more serious nature, it might turn out to be a Trojan horse or a self-replicating virus that cannot be easily removed or a combination. Below you will see two examples of Android Flashlight malware – one that is in the form of a Trojan horse and one in the form of an adware. Last year, an Android Flashlight malware which posed as an application called ”Flashlight LED Widget” was in actuality a Banking Trojan. Once installed on your phone, the fake pop-up would trigger over the legitimate application of a bank login page, thus tricking users into leaving their login details in the fields provided by the pop-up. There is no need of telling you how bad the stealing of such credentials is and that it can even lead to an identity theft and other nefarious actions. That ”Flashlight LED Widget” is also a combination of self-propagating virus that will send itself to other people’s devices over the network and it is really hard to be removed manually. The phone could even begin to stutter, freeze and crash after the login credentials have been entered into the phishing form. The Android Flashlight malware that goes by the name of “Flashlight – Best Flashlight” will show you many advertisements and endlessly redirect you once you open your browser. To make matters worse, some free Anti-virus software applications might not even detect it. Application gives you the best and quality light and performance by using the LED beam. You can switch it on and off very easily. At the same time, there is a screen showing the telephone temperature. You can also follow on the same screen the level of charge. – There is a screen showing phone level of charge. You will see heaps of redirects and adverts from it and that can make money for the owners of the adware with the help of a pay-per-click scheme. You will probably witness targeted advertisements, pop-ups and other sponsored content on the website from its business partners and affiliates. That could be the result of the tracking cookies used by the malware. Android Flashlight Malware – How To Spot It? As you can see there is only one true comment exposing the adware application, while the other comments are paid for, written by bots or affiliates of the developers of the malware of “Best Flashlight”. We at SensorsTechForum hope that this information has been helpful. Below you will find out how to completely remove such threats from your devices (including PC instructions in case you are running a Virtual OS or similar software). In order to remove this malware from your PC, it is strongly advised to follow the removal instructions given below. They are divided into computer and mobile removal instructions and can help you remove this malware either manually or automatically. For maximum effectiveness it is recommended to use the automatic approach and download an advanced anti-malware tool to scan for and fully remove all malicious objects of Android Flashlight malware from your PC or smartphone device. Threats such as Android Flashlight malware may be persistent. They tend to re-appear if not fully deleted. A malware removal tool like Combo Cleaner will help you to remove malicious programs, saving you the time and the struggle of tracking down numerous malicious files. Threats such as Android Flashlight malware may be persistent on your system. They tend to re-appear if not fully deleted. A malware removal tool like SpyHunter will help you to remove malicious programs, saving you the time and the struggle of tracking down numerous malicious files. Note! Your computer system may be affected by Android Flashlight malware and other threats. SpyHunter is a powerful malware removal tool designed to help users with in-depth system security analysis, detection and removal of threats such as Android Flashlight malware. 1. Install SpyHunter to scan for Android Flashlight malware and remove them. 2. Scan with SpyHunter, Detect and Remove Android Flashlight malware. Ransomware infections and Android Flashlight malware aim to encrypt your files using an encryption algorithm which may be very difficult to decrypt. This is why we have suggested several alternative methods that may help you go around direct decryption and try to restore your files. Bear in mind that these methods may not be 100% effective but may also help you a little or a lot in different situations. Note! Your computer system may be affected by Android Flashlight malware or other threats. Remove Android Flashlight malware by cleaning your Browser and Registry. Fix registry entries created by Android Flashlight malware on your PC. Combo Cleaner is a powerful malware removal tool designed to help users with in-depth system security analysis, detection and removal of threats such as Android Flashlight malware. Step 5: In the Applications menu, look for any suspicious app or an app with a name, similar or identical to Android Flashlight malware. If you find it, right-click on the app and select “Move to Trash”. Step 6: Select Accounts, after which click on the Login Items preference. Your Mac will then show you a list of items that start automatically when you log in. Look for any suspicious apps identical or similar to Android Flashlight malware. Check the app you want to stop from running automatically and then select on the Minus (“–“) icon to hide it. Remove Android Flashlight malware – related extensions from your Mac’s browsers. A pop-up window will appear asking for confirmation to uninstall the extension. Select ‘Uninstall’ again, and the Android Flashlight malware will be removed. When you are facing problems on your Mac as a result of unwanted scripts and programs such as Android Flashlight malware, the recommended way of eliminating the threat is by using an anti-malware program. Combo Cleaner offers advanced security features along with other modules that will improve your Mac’s security and protect it in the future. Hey !, I found this information for you: "Remove Android Flashlight Malware". Here is the website link: https://sensorstechforum.com/remove-android-flashlight-malware/. Thank you.